By exploring different granularities of data-level and task-level parallelism, we propose 16 implementations of an Advanced Encryption Standard (AES) cipher with both online and offline key expansion on a fine-grained many-core system which contains no algorithm-specific instructions or hardware. The smallest design utilizes only 6 cores for offline key expansion and 8 cores for online key expansion, while the largest requires 107 cores and 137 cores, respectively. With frequency and voltage scaling, the power of different implementations is reduced as much as 32%. In comparison with published AES cipher implementations on other software platforms, our design has 3.3--15.6 times higher throughput per chip area and 3.4--21.7 times higher energy efficiency. 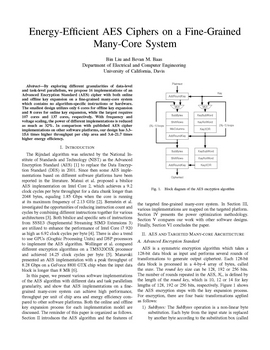 Bin Liu and B. M. Baas, "Energy-Efficient AES Ciphers on a Fine-Grained Many-Core System," Technology and Talent for the 21st Century (TECHCON 2012) Sep. 2012.